Every once in a while, just like candy bars, a new beverage is introduced to the market, and it's usually a slight variation on an existing brand. In this case, the newest addition is Pepsi Next, a low-calorie substitute for regular Pepsi. This appears to be Pepsi's answer to the reasonably popular Coke Zero, where there is less reliance on sugar substitutes. It appears to be on the standard rotation for stock, as I've seen it pretty much anywhere regular Pepsi is sold. 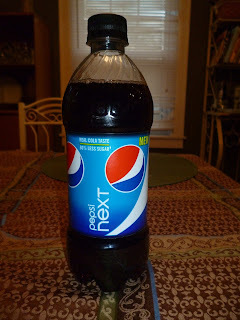 I am one of those individuals who started drinking Diet Pepsi a long time ago (I don't care for Diet Coke, though I have no problem drinking it), and so moving back to the normal sugar-laced Pepsi was never really an option. It's too sweet and even drinking half of a bottle gives me shades of heartburn at this point. Like Coke, I have no problem drinking it and will accept it if offered, but my taste buds clearly prefer the diet variety. So how does Pepsi Next taste? Not bad, actually. It tastes very similar to regular Pepsi and doesn't have an aftertaste, though you can tell that it's different and less sweet. It's clearly targeting the market of individuals who don't like the aftertaste of diet drinks but still prefer a low-calorie options. Sadly, I am not in that demographic. Not that it was bad, but at this point I actively prefer the taste of diet pop at this point. I may occasionally get it just for something different, but it's not something I am going to switch to. So I recommend it greatly if you fit the description above; this is especially true if you're sold on the differences between Coke and Coke Zero. If you are, like me, addicted to artificial sweeteners and caffeine, best to stick with what you have. The only concern I have with this endeavor is one of marketing. It seems like there's a finite number of variations you can have before everything gets too top-heavy, and I fear Pepsi may have reached it. Right now, there are five "standard" Pepsi variations: Pepsi, Diet Pepsi, Caffeine Free Pepsi, Diet Caffeine Free Pepsi, and Pepsi Max. You'll still see variations such as Pepsi Throwback (with cane sugar instead of corn syrup) and Wild Cherry Pepsi (also, I still see Pepsi One in places, which just confuses me). There's only so much shelf space and slots in vending machines, and Pepsi still has a lot of other brands (such as Mountain Dew or Lipton Iced Tea) that are also options. New releases like this are hard to crack. I'm sure Pepsi has done the appropriate market research and logistics for this, but I'm not sure it's distinct enough to be part of the regular lineup. We shall see.